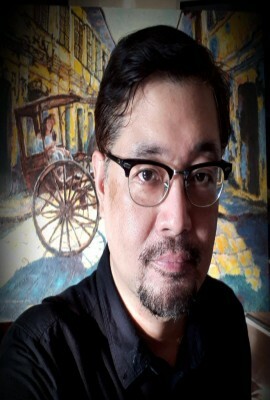 Joey Agbayani was born in Quezon City, Philippines in 1965. While studying Architecture at the University of the Philippines, Agbayani participated in several film workshops and seminars sponsored by the Goethe Institute, the Mowelfund Film Institute, and the UP Film Center. His very first short film "The Eye in the Sky" won 1st Prize and Best Student film at the 1984 Experimental Cinema of the Philippines Short Film Festival. His second film "Kidlat" (Lightning) won Best Short Feature at the 1989 Film Academy of the Philippines Awards and the Gawad Urian Awards. "Kidlat" was chosen as the Philippine Official Entry to the 1990 Foreign Student Category of the Oscars (AMPAS). After graduating college with a Bachelor of Science Degree in Architecture, Agbayani persued a career in directing television commercials and music videos. His first television commercial "Odyssey" won the 1991 Ad of the Year Award given by the Advertising Creative Guild. In the mid 1990's Joey and his brother Rob directed a television musical show called "Music Bureau" and several music videos for their sister, recording artist Viktoria. In 1999 their music video "Puede Ba" bagged several awards including Best Music Video Director and Best Music Video of the Year at the 1999 Awit Awards. "Puede Ba" also won Best Female Artist Video for MTV Philippines. Today, Agbayani continues to make animated and live-action film projects. His recent animated shorts "Lola" and "The Ghostwriter" received major awards from several international film festivals. Agbayani's films have been shown in worldwide and prestigious festivals such as the Asian American International Film Festival, The New York City Horror Film Festival at the Tribeca Cinemas, Festival du Court Metrage Clermont Ferrand, Festival de Cine Alcala de Henares, Berlin Independent Film Festival, Independent Days Film Festival in Germany and the Edinburgh International Film Festival in UK.In 2013, Joey Agbayani received the Inquirer Indie Bravo! Award, an award of distinction given by the Philippine Daily Inquirer to filmmakers who have garnered international awards and for their exemplary achievement in the cinematic arts.